I read this Scientology fundraising letter for one of their front groups which includes the standard pitch for donations to keep fighting the evil psychs but I was surprised to see a shout-out to major corporate sponsors. 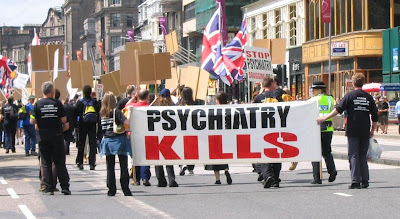 Do these companies know that they are forwarding Scientology’s agenda of destroying psychiatry? Summer is once again upon us and it is Ablechild’s 5th year participating in the New Canaan, CT Chamber of Commerce Sidewalk Sale. This year we’d like to do things a bit different and want to include our members and supporters nationwide. Typically, Patty Weathers and I sweat it out from 8 am to 5 pm setting up Ablechild’s tent, running a game for children to play for dollar donations, and holding an auction and raffle. We do this in order to keep Ablechild’s work moving forward. The community sidewalk sale also gives Ablechild the opportunity to warn parents early by disseminating information regarding the labeling and drugging of children by schools and medical practitioners. We have continued to do this on a shoestring budget year after year. With your help and participation in the virtual sidewalk sale, together we can make an even bigger difference. Much more funding is needed to help us reach out to more parents and children and work on ensuring their rights to full informed consent. With that said, our plan is simple: Let’s see how much we can raise before 5pm on July 18, 2009 starting now. At the sidewalk sale we will be asking for $2 for children to play a toss game for a prize. Wanna play a few games? Donate Now! If you can make a donation of any size, we would greatly appreciate it! Check out the recent debate on CNN regarding this issue. We would like to acknowledge and thank our corporate contributors (Smith & Hawkins, J. Crew, Wal-Mart and Microsoft Corporation) for supporting our efforts to make a difference on this issue. If you would like to become a corporate contributor, call Ablechild at 203-594-1700. Copyright 2001- 2007 Ablechild (Parents for Label and Drug Free Education). All rights reserved. Ablechild is a nonprofit, tax-exempt, Section 501(c) (3) charitable organization, and donations are deductible under the provisions of the IRS Tax Code. Ablechild and the Ablechild logo is a Trademark of Ablechild, Inc.
That’s the question raised by this Anonymous website and a cool new video from Kate Morrigan over at Vimeo. Here’s the latest masterpiece from TheEvilof Scientology. There’s now recorded evidence of Slappy’s violent nature.